A blog to debate the Building Control (Amendment) Regulations (BCAR): The BRegs Blog presents an opportunity for free expression of opinion on BCAR and their implementation. 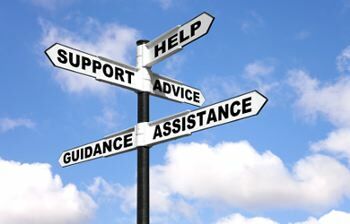 The blog is not representative of any professional body or organisation. Each post represents the personal opinion of that contributor and does not purport to represent the views of all contributors. 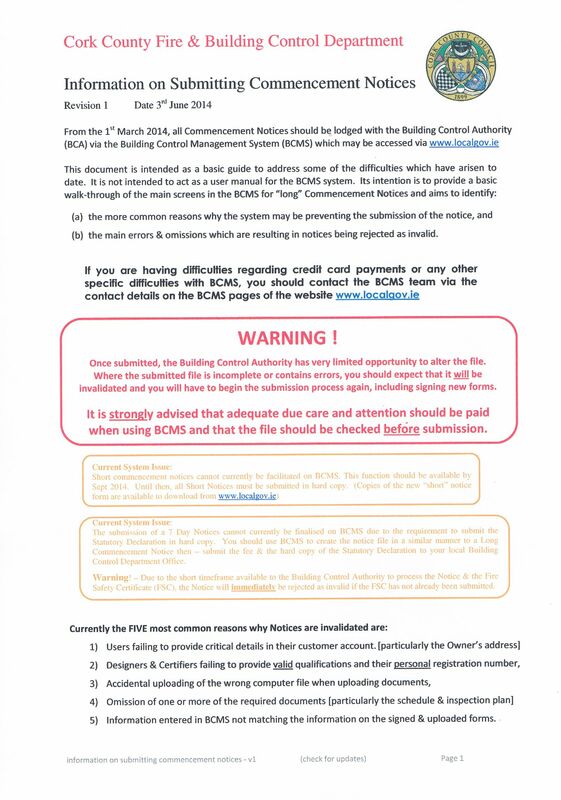 The following informative 8 page guide was issued by Cork County Council on 3rd June 2014 to help professionals with lodgment of commencement notices under the new Building Control Management System (the new building regulations). Applicants will be grateful to Cork County Council for providing this most helpful guide for those trying to navigate the complexities of the new BC(A)R system. 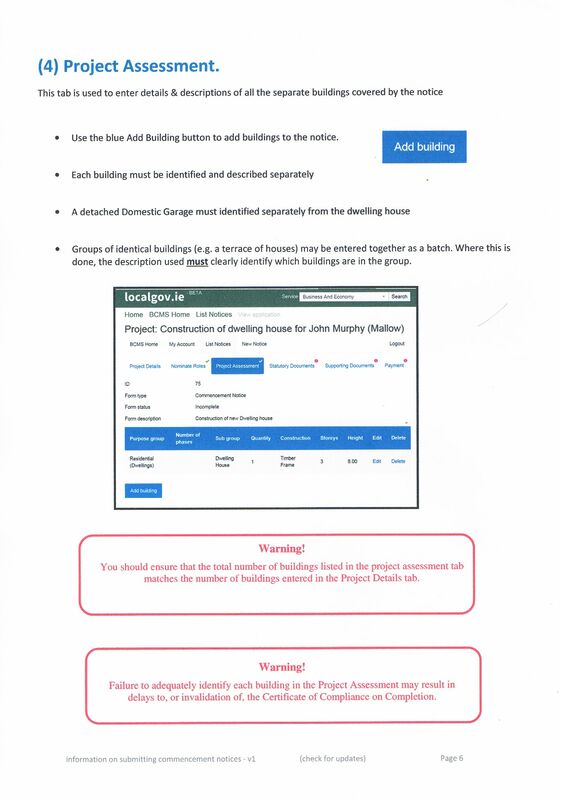 Some of the user issues highlighted are the accuracy of information uploaded (no provision to delete once uploaded) and inclusion of valid professional details (see previous posts on this). 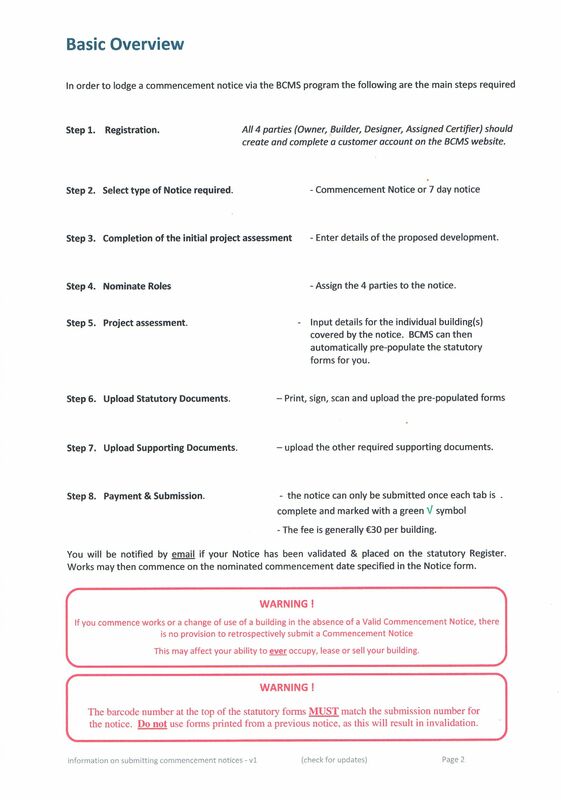 In the guide they note that there is no retrospective mechanism for compliance under the new building regulations for projects completed without valid commencement notices. 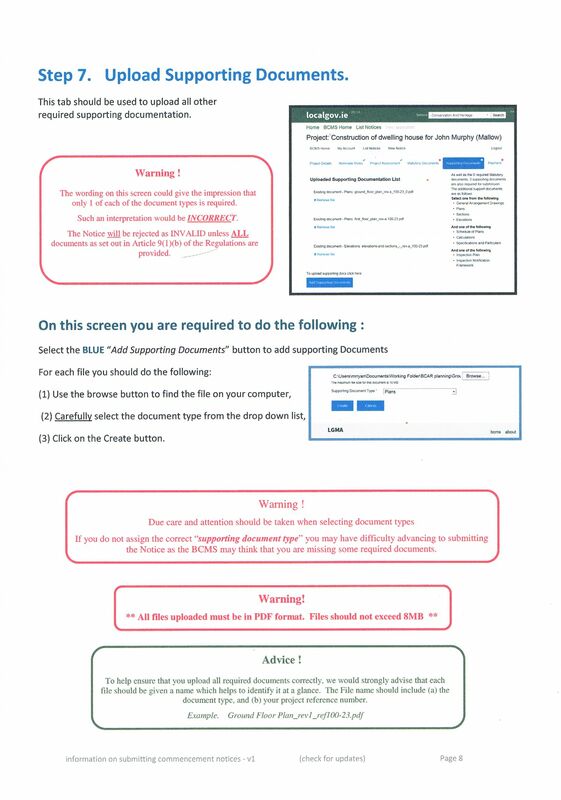 They also highlight some of the system issues that affect the BCMS and document lodgment procedure currently. 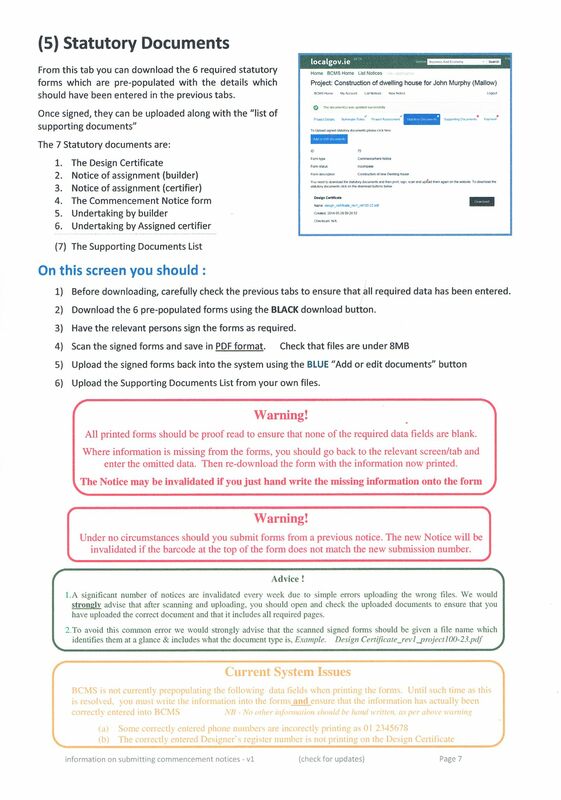 In the advice (page 1) they note that currently 7 day notices cannot be finalised online using the BCMS as a statutory declaration must be submitted as a hard copy. 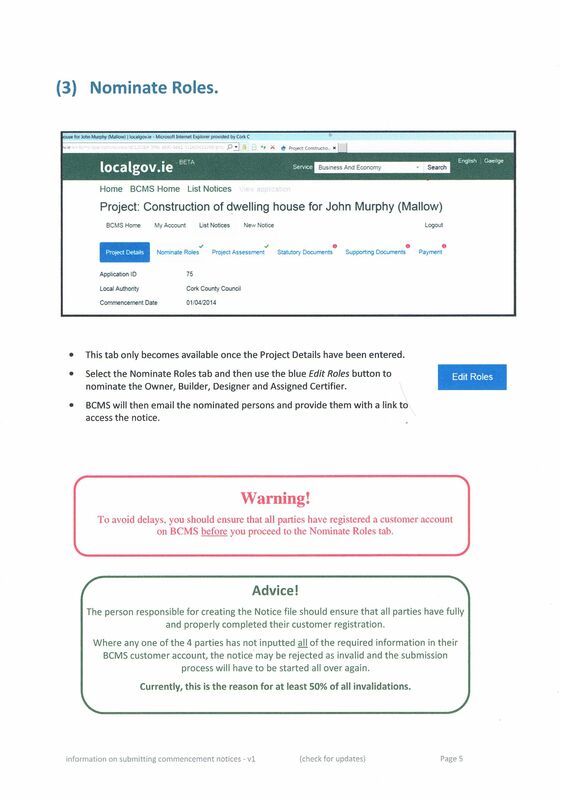 In addition Cork County Council have stated that they require the ‘Designer’ to be a registered professional. 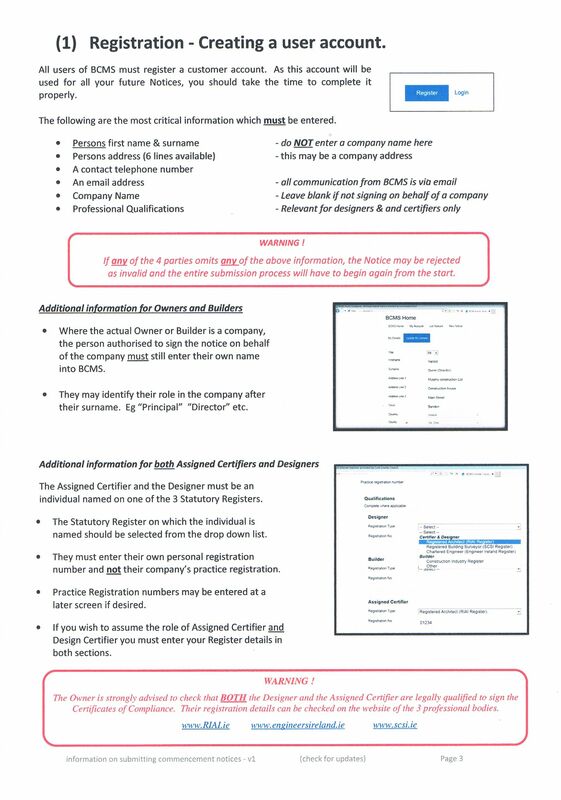 This may need to clarified as we would assume they mean Design Certifier rather than Designer (see page 3). The requirement in the new regulations is for design certifier (and assigned certifier) to be a registered chartered surveyor, engineer or architect only. 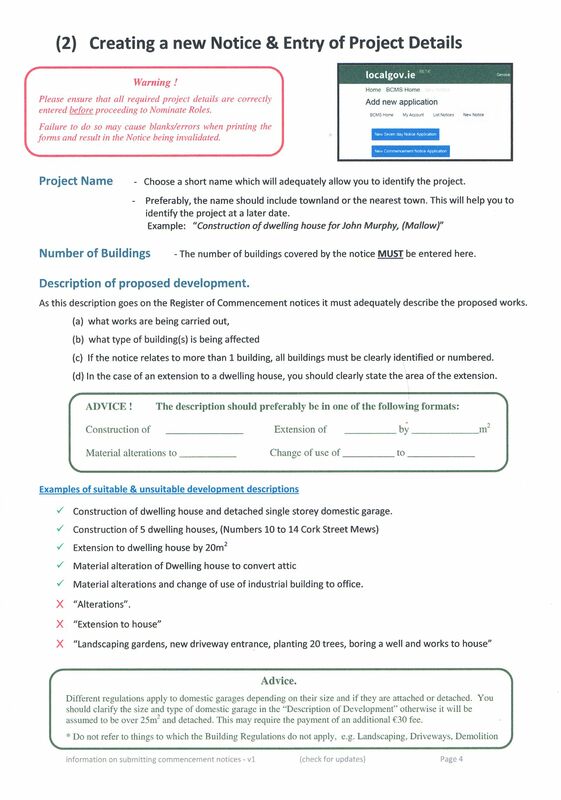 There are also issues associated with groups of buildings coming under one commencement notice that may affect validation on completion (page 6)- an important section for phases of residential units under construction. This is a very useful document and we suggest it may be applicable to other Local Authorities also.